Even if you mastered E. Honda’s Hundred Hand Slap or helicopter-kicked your way to gaming immortality in the early ‘90s, there are still a few things you might not know about the Street Fighter franchise. Give your brain a Dhalsim-style stretch with these facts about the beloved fighting games. 1. IT IS NAMED AFTER A (VERY VIOLENT) JAPANESE MARTIAL ARTS MOVIE. The game was named in honor of the 1974 martial-arts powerhouse Clash, Killer Fist! (titled The Street Fighter for American release), which starred renaissance performer Shinichi “Sonny” Chiba and was the first film to receive a U.S. theatrical rating of X for violence alone. You can watch the NSFW English trailer above. 2. SOME OF THE ARCADE CONSOLES HAD PRESSURE-SENSITIVE "PUNCH PADS." The original 1987 release of Street Fighter was initially distributed in a regular version, sporting the six-button setup that would feature on Street Fighter II machines, and a deluxe version, which had rubber punch pads underneath the buttons that registered the amount of pressure applied for light, medium, or heavy punches or kicks. These pads tended to wear out quickly, however, and players on both types of console often preferred the general strategy of smashing all buttons as forcefully as possible. 3. STREET FIGHTER’S GROUNDBREAKING COMBO SYSTEM CAME FROM A BUG. The first game was rolled out with special moves, but they weren’t advertised by Capcom—so the only way to learn about them was from other players. Pulling off the moves required near frame-perfect timing. During Street Fighter II’s production, it was decided that if these moves were made easier to do, it would make the game less about luck and more about skill. To this end, the programmers increased the number of frames allowed between inputs, giving the player slight leeway in punching buttons. But this had the side effect of creating combos, allowing players to do a crouching kick while punching, for example. Capcom wanted in on the action, so it gave the task of making a similar—but even better—combat game to designers Takashi Nishiyama and Hiroshi Matsumoto. 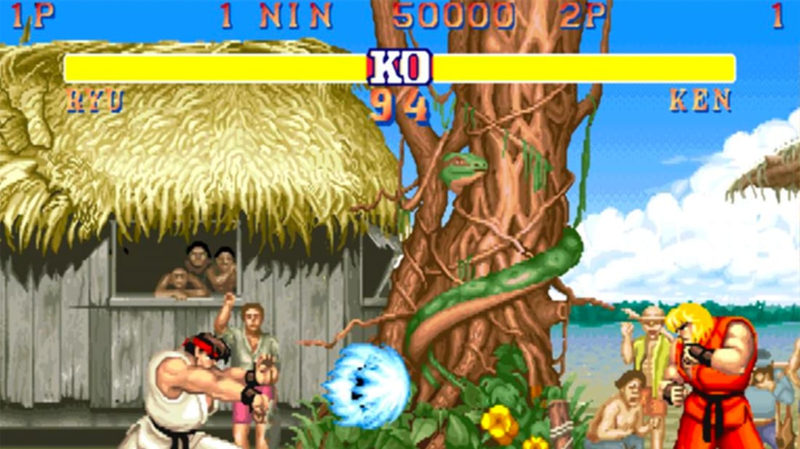 Much of the gameplay of 1987’s Street Fighter mirrored the strengths of Yie-Ar Kung Fu, but it also gave players a choice of three locations for their first fight before moving up the ladder of opponents. Access to hard-hitting special moves that could be hard to pull off with the original game’s hardware was another novel feature. Graphic designer Keiji Inafune also upped the ante on character design, borrowing some of the aesthetics of popular manga and anime series. 5. ... AND STREET FIGHTER II HELPED THE GENRE EXPLODE. Capcom tried to follow up its Street Fighter home computer version with the beat-em-up game Final Fight, and Tiertex (who were behind one of the Street Fighter ports) developed a blatant cash-in called Human Killing Machine. When neither game found a big audience, Capcom instead worked to improve Street Fighter for arcades with better graphics, a wide range of new characters, and smoother, faster gameplay. In 1991, Street Fighter II: The World Warrior hit arcades. 6. MANY OF STREET FIGHTER II’S MOST KILLER MOVES CAME FROM HACKERS. Street Fighter II was an instant hit, and players enthusiastically started hacking the game to make it even better. When Capcom’s follow-up release Street Fighter II: Champion Edition—which required arcade owners to upgrade to new, costly, supposedly limited-release units—failed to dazzle players, a wave of unofficial enhancements containing fans’ favorite hacks (and requiring only simple ROM upgrades to existing machines) spread through the market, including the “Rainbow Edition,” “Accelerator T1,” and several “Super”/”Turbo”/“Hyper” sets. Capcom cracked down on these illegal (if innovative) copyright violations, but the company took the hint and quickly released Street Fighter II Turbo - Hyper Fighting, with faster gameplay featuring many of the best hacked moves, as a simple ROM upgrade for Champion boards. In the original game and many like it, players could only play from the perspective of a default character (Ryu in Street Fighter) or join a friend’s game as a second default martial artist (Ken). With Street Fighter II, players were suddenly able to select from a broad range of characters to play, all with their own backgrounds, fighting stats, and special moves, a smorgasbord of choices that became the standard for fighting games. 8. ... AND HAD ONE OF THE FIRST FEMALE CHARACTERS GAMERS COULD ACTUALLY PLAY. Chun-Li was the first female character in the Street Fighter canon and the first important playable woman in a fighting game (the first playable woman in a fighting game was probably Typhoon Gal in 1985, and no, no one else has heard of it, either) paving the way for characters such as Lara Croft. An expert martial artist and Interpol officer bent on avenging her father’s death, gaming’s “First Lady” has been one of the series’ most popular characters since 1991, has been featured in numerous games, comics, and films, and has lightning-kicked her way onto countless “best of” lists, from those naming gaming’s top heroines and Capcom figures to roll calls of favorite overall characters in the medium’s history. 9. THE MOVIE FLESHED OUT THE CHARACTERS’ NAMES. For 1994’s feature film Street Fighter, a number of the game’s characters gained first or last names that largely didn’t follow them back into the franchise. For example, Guile became William F. Guile, Sagat became Viktor Sagat, Ryu became Ryu Hoshi, and Chun-Li took on the last name Zang. 10. PLAYERS “MUST DEFEAT SHENG LONG,” BUT HE DIDN’T EXIST. In the original Street Fighter, Ryu would tell players, "You must defeat Sheng Long to stand a chance." This line represented a mistranslation of the intended phrase, "You must defeat my dragon punch to stand a chance." This shoddy translation confused many early fans and became a long-running joke for Capcom, which adapted the imaginary mentor figure into Gouken (and, in Super Street Fighter II, the hidden character Akuma, Gouken’s younger brother) and nearly included Sheng Long as a character in Street Fighter: The Movie: The Game. As the gaming site 1up.com illustrates, few of Street Fighter’s first wave of characters turned out looking much like the original character sketches mocked up by the games’ designers. Vega, for example, was first imagined as a traditional armored, sword-bearing knight, but was eventually developed into a figure with a “Spanish ninja” feel. 12. ... AND SOMETIMES VEGA IS BALROG, AND BALROG IS M. BISON. Street Fighter designers were inspired by some real-life fighting champs when they were creating characters, with Fei Long channeling Bruce Lee, and M. Bison (or Mike Bison) bearing a strong resemblance to boxer Mike Tyson. To avoid legal backlash when releasing the game in the U.S. and elsewhere, Capcom came up with the following system for swapping character names and roles in the game: In Japan, the boxer character is called M. Bison, and in the U.S. he’s Balrog. In Japan, the “Spanish ninja” character is Balrog; in the U.S., he’s Vega. And while Vega heads the evil Shadaloo group in Japan, M. Bison (as a separate character from the boxer Balrog) takes the reins in the U.S.
13. IT’S IN THE GUINNESS BOOK OF WORLD RECORDS EIGHT TIMES. The Street Fighter franchise holds the Guinness World Record for “Most Prolific Fighting Game Series” for its 127 games as of 2014, but it has also scooped up “Longest-Running Fighting Video Game Series,” “Best-Selling Coin-Operated Fighting Game,” and five other titles. 14. IT REMAINS CAPCOM’S BEST-SELLING GAME. Once Street Fighter II took gaming by storm, Capcom started raking in major funds, with game sales bringing in $1.5 billion by 1993 and gross revenues from its 200,000 arcade cabinets hitting $2.3 billion by 1995. The Super Nintendo Entertainment System (SNES) version also sold more than 6.3 million units, making it Capcom’s best-selling software for a single platform to date (and second overall, after Resident Evil 5). One million of those SNES units were snatched up in June of 1992 in Japan within the first two weeks the game was available. 15. GAMES AREN’T ENOUGH? THEN CHECK OUT THE STREET FIGHTER MOVIES, SHOWS, AND ROCK OPERA. In addition to 1994’s less-than-popular theatrical release, Street Fighter has graced screens big and small through live-action American and Chinese films (the latter was a time-traveling romp called Future Cops) as well as animated TV shows and full-length films from Japanese, Korean, and American production companies. The band Man Factory has also released a rock opera based on the game.